If you’ve taken a walk down any health foods store then you’ve definitely seen bags of flaxseed. If you’ve opened any newspaper or magazine you’ve seen a few articles about their benefits. Unfortunately, it’s not the easiest food to include in your meals or snacks. I could never get myself to like the texture of ground flax and its weird bland taste. There is one simple way around this though – adding flaxseed to your smoothies! A delicious smoothie easily hides the taste of flax. Moreover, as a busy person always on the go, I’m constantly looking for easy ways to be healthier. I’ve found smoothies to be perfect for getting my daily dose of flaxseed. The great thing about smoothies is the ability to quickly and easily consume a whole heap of nutrients in one go. So, don’t miss out on a really easy way to boost your health and help your fat loss efforts. These tiny little seeds pack a lot of punch, nutritionally speaking! ​Studies have shown that flaxseed (also called linseed) can boost your health in a big way, especially when it comes to heart health. Research has suggested that flaxseed can decrease levels of LDL cholesterol (that’s the bad kind you want to have less of! ), especially for men. Many of these heart related benefits come from the omega-3 fatty acids in flaxseed. In particular, it contains a fatty acid known as Alpha-Linolenic Acid (ALA). 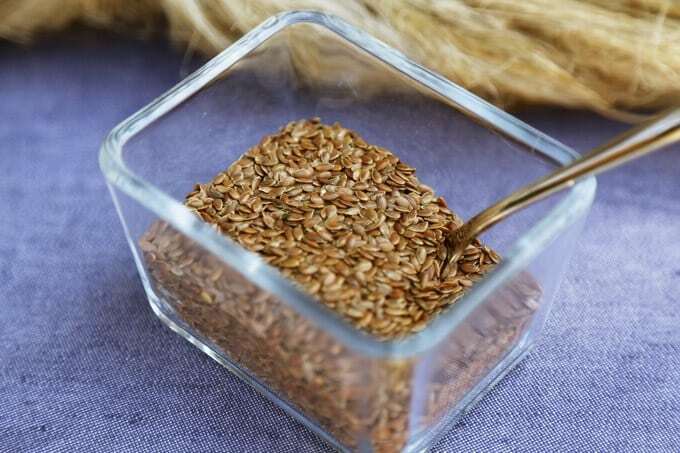 The lignans in flaxseed may have antibacterial and antiviral qualities. Making flaxseed a regular part of your diet can therefore have the potential to help you to be ill less often and for colds to be less severe. 2004 research in the Nutrition Journal found that as part of a diet rich in fruits and veggies, flaxseed can make you less likely to get cancer – particularly certain types. The University of Maryland Medical Center indicated that the lignans in flaxseed may lessen your risk factor for cancers of the prostate, breast and colon. As if the health benefits of flaxseed aren’t enough, here’s yet another reason to love it: it’s your secret weapon when it comes to weight loss! ​Flax is full of fill-you-up fiber and protein to keep you sated. You’ll eat fewer calories and be far less tempted to snack. The ALA in flax also reduces inflammation in the body. This is more important than you might think as inflammation makes it harder for your body to lose weight. The less inflammation you have, the more likely you are to lose fat. In this tutorial, I’m going to share my top tips for making delicious flaxseed smoothies. How much Flax to add to your smoothie? You don’t need too much flax in any one go due to the fat content (even though they’re of the healthy kind!). 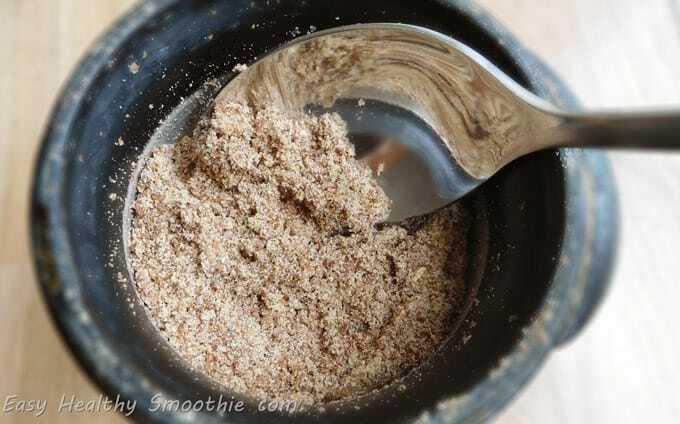 Adding around 1-2 spoons of ground flax seeds to your smoothie is usually enough to get the benefits and the taste. Flax seeds aren’t that easy to digest and our bodies don’t absorb the full array of nutrients unless they’re ground up first. How to grind whole flaxseed? Not all blenders can cope with grinding flaxseed and many people fear for their lower end blenders for this reason. If you don’t have a high end blender (like a Blendtec or Vitamix) that is capable of grinding flax seeds really quickly and effortlessly, there are a few alternatives you can use instead. A coffee grinder or spice grinder will pulverize the flax seeds before you blend them. This is what I do every morning and it’s an easy, cost effective option for grinding your flax. Alternatively, a Blendtec twister jar, can do the job really quickly so they’re perfect if you’re pushed for time and need to grind your flax as quickly as possible. It’s an effective method, but not so cheap. If you’d prefer to have a separate appliance that’s only used for grinding flax, a spice mill may work better for you. These work on a really simple basis; you just twist and the ground flax seed starts to come out. The reason I’m talking about them last in this section is the time it takes to fully grind the flax this way. How coarse or fine should you grind flax? With some blenders, you won’t always be able to achieve this kind of consistency but you should have no problems getting to this stage with less than 30 seconds of grinding with most high end blenders and coffee/spice grinders. The best way to get the nutrients from flax seed is to consume them in sprouted form. This is a bit more complicated and time consuming as it involves growing your flax from seeds on a wet vehicle, rather than in the more traditional way of growing seeds. ​You’ll need a terracotta plate. These are widely available from home and garden stores and nurseries. Also buy a bag of flax, preferably the most natural and organic you can find. Leave them for a few days and they should start sprouting! You can get some of the benefits of flaxseeds by using flaxseed oil in your smoothies. Just be aware that while flaxseed oil does contain ALA, it doesn’t have the fiber that you’ll find in whole flax so it won’t provide all of the health or weight loss benefits that you’d expect from flaxseed. For a complete alternative, you can try chia seeds instead. These are also a good source of protein and fiber, and also contain calcium. The soluble fiber in chia seeds can also reduce cholesterol and help you to feel fuller. Flaxseed can have a slightly nutty taste but it’s largely neutral so it goes well with a lot of fruits and in green smoothies. A lot will come down to your personal tastes when you’re deciding which ingredients to use in flaxseed smoothies. After this, it’s time to add the flax into the equation. It’s important to include the flax before you get to the blending stage so that it can be evenly distributed in the smoothie mixture. Otherwise, you risk it being concentrated in certain areas and this can affect both the taste and texture of your smoothie – usually for the worse! You can use a few different liquids as the base for flaxseed smoothies, including water, milk, nut milk and coconut water. They all go well with flax so its down to your taste preferences. Now you’re good to start whipping up your smoothie in the blender! Just blend until smooth. The flax would mix well and slightly thicken the texture of the smoothie. P.S. If your smoothies have a tendency to be not quite right, check out my beginner’s cheat sheet with tips on how to make the perfect smoothie! ​Always check the Best Before dates when you buy flax so you can be sure you’ve got the freshest one. Look for bags with opaque packaging as light can destroy the nutrients in flax and make the oils go bad. Whole flax can be stored at room temperature in a cool and dry place for up to a year. However, just to be on the safe side I store them in the refrigerator. It’s best to grind your flax just before you intend to add it to a smoothie. If you’re really short on time, you can grind for a few days ahead and store in an airtight container, to stop it being exposed to air too much. Keep the ground flaxseeds refrigerated after grinding them and use within 15 days. Always remember ground flax and flaxseed oil need to be kept in the refrigerator to stop them spoiling – this is particularly important for flaxseed oil. Now for the really fun part – those all important recipes to help you make the most of flaxseeds! Check out the smoothie recipes back at the original article by clicking here.